At the Moulin Rouge (French: Au Moulin Rouge) is an oil-on-canvas painting by French artist Henri de Toulouse-Lautrec. It was painted between 1892 and 1895. It is one of a number of works by Toulouse-Lautrec depicting the Moulin Rouge cabaret built in Paris in 1889; the others include At the Moulin Rouge, The Dance and the poster Moulin Rouge: La Goulue. The painting portrays a group of three men and two women sitting around a table. From right to left, the people at the table are: Édouard Dujardin, dancer La Macarona, photographer Paul Secau, and photographer Maurice Guibert. The woman in the right foreground is English dancer May Milton. 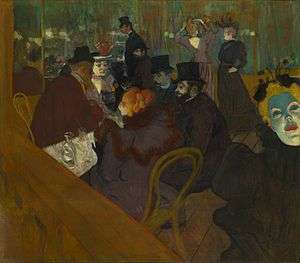 In the background, on the right, you can see La Goulue with a partner; the left background shows Toulouse-Lautrec himself and Gabriel Tapié de Céleyran. At the Moulin Rouge is under ownership of the Art Institute of Chicago as part of the Helen Birch Bartlett Memorial Collection, where it was first displayed on December 23, 1930. It was exhibited in London in 2011 at the Courtauld Institute of Art. It is currently on display in the Art Institute of Chicago as part of the permanent collection. ↑ Johnson, Ken (2005-03-18). "Lautrec's Life, High and Low". The New York Times. pp. para. 7. Archived from the original on December 20, 2013. Retrieved 2008-04-27. ↑ "At the Moulin Rouge | The Art Institute of Chicago". www.artic.edu. Retrieved 2016-01-20. ↑ "Toulouse-Lautrec's At the Moulin Rouge". Smarthistory at Khan Academy. Retrieved March 4, 2013.